With all the talk about Apple moving the browser tabs to the title bar, you would almost think that the newly released Safari 4 beta offered no other features of note. That’s obviously not true, as just a brief scan of Rob Griffiths’ extensive first look at the beta would tell you. There are plenty of nice additions to Safari in this new version; one of my favorites is the Cover View view. Safari 4 adds a search box that shows your surfing history. When you click in the search box, you get a view of Web pages identical to the Cover Flow display in iTunes or Mac OS X Leopard’s Finder. Cover Flow also shows up when you view your History or Bookmarks pages. While most of the people on my Twitter feed were arguing about whether or not the tabs worked on the top of the browser or not, I was happily searching through my history using Cover Flow. Having a visual way of seeing the sites I visit is a huge time saver, especially when you add in the ability to search your history. 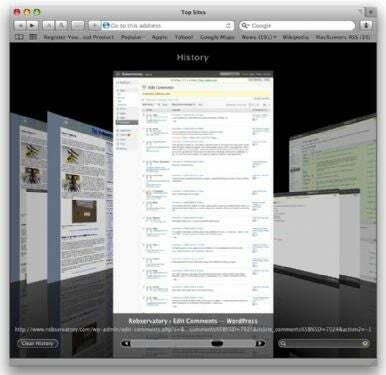 Safari 4 lets you search your history by keyword. That means that it will search the URL, title bar, and most importantly, the actual content of the pages you visited. Type a search term in the search box, and Safari whittles down the number of displayed pages to match your results. It’s like having Spotlight for your Web sites. I visit a lot of Web sites a day, doing research for stories as well as visiting some of my favorite music sites. Sure, I could use the old way of viewing my history as a list, but it’s not nearly as efficient or accurate as this Cover Flow view. For example, when I’m researching a story, I often come across obscure references to my topic. Unfortunately, I don’t always bookmark those pages for reference. The end result is that they are lost in the mire of Web links in my browser history. It gets even worse if you factor in a few days’ worth of browsing to wade through. Having an enhanced search via Cover Flow gives me a way to narrow down my search and then scroll through windows with a thumbnail of the Web site. Even if I don’t recognize the Web link in the list, I’ll more often than not recognize what the site looked like with the Cover Flow thumbnail. Cover Flow on its own probably wouldn’t be that useful in a Web browser. However, just like in iTunes, having the combination of Cover Flow and the search functionality makes finding things much faster. Ultimately, that makes my experience using the software better.